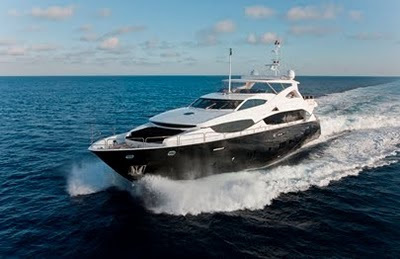 The 111.5' Sunseeker Black and White, built in 2010 is now available for charter in the Caribbean and Mediterranean. The spacious master cabin is on the main deck and features a unique fore window which allows guests to look out to sea from the comfort of their own bed. The master cabin has full en-suite with jacuzzi bath, gold mozaic tiles hammam and a seperate WC. The VIP cabins have en suite show rooms, as do the spacious twin cabins. Bang and Olufsen Audio Visual systems throughout. All guest accommodation is furnished to the highest standards with Fendi furniture and Philip Starck furniture throughout.